Magic happens at the intersection of profit and purpose. 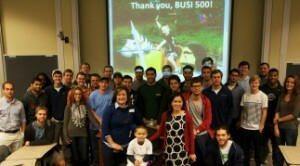 That was the lesson Jim Kitchen wanted to teach undergraduate business students in his Intro to Entrepreneurship class. But rather than simply speaking those words in the classroom, he wanted to give students an opportunity – and a mission – to learn by doing. Through a project dubbed “Ready, Fire, Aim,” Kitchen gave students a crash course in launching a profitable business. They were given just four days and $50 in seed money to form two-person teams, with the goal of creating as much profit as possible by selling a product or service of their choosing. The proceeds, they were told, would send six-year-old Scott Lenfestey and his family on the trip of a lifetime through Make-A-Wish Eastern North Carolina. And so they did – in a big way. In just four days, students from Kitchen’s two course sections raised over $15,000 – more than enough to grant Scott’s wish and fund another. Students approached the task in a variety of ways. Brent Comstock (BSBA ’17) and Benton Moss (BSBA ’15) recognized the challenge of working on a limited timeline and around different schedules. Their strategy was to pick an item that would be quick and easy to sell – silicon bracelets engraved with #BeatCancer and #ScottsDream. “We had a great, simple product that practically sold itself and also had a very straightforward pitch to achieve sales,” Moss said. Comstock and Moss used digital marketing to spread the word, creating a website and promoting the bracelets on social media. They also sold bracelets in a high-traffic area before the UNC-San Diego State football game. “90 percent of our profits came from being there on game day,” said Comstock. Austin Helms (BSBA ’16) and Lyle Jones (BSBA ’15) kicked off the challenge by fundraising and garnered several generous donations by simply reaching out to business connections in the community and sharing Scott’s story. Next, they went door-to-door taking and delivering milkshake orders in Morrison Residence Hall. And on game day, they set up shop just outside the gates at Kenan Stadium to sell bottled water and sold out in less than two hours. While the teams each took a different approach to attract customers and sell their products or services, all agreed that much of their success could be attributed to Scott and his story. Students had an opportunity to see the impact of their work firsthand when Scott and his mom, Nancy (BSBA ’98), surprised them during class. After thanking the classes for their hard work, Mrs. Lenfestey gave a brief presentation to help students better understand the long and difficult journey Scott has endured since being diagnosed with Acute Lymphoblastic Leukemia (ALL) at two-and-a-half years old. Scott underwent months of intensive chemotherapy treatments with debilitating side effects, she told students, followed by several years of treatments to keep the cancer in remission. His diagnosis and rigorous treatment schedule affected not just Scott, but his siblings as well. “Everyone has something taken away during treatment,” she said, quoting one of Scott’s nurses. Mrs. Lenfestey and her husband waited until Scott’s condition was stable before discussing the idea of a family trip to Orlando. This spring, a nurse at NC Children’s Hospital submitted Scott’s Make-A-Wish application. And in the happiest of coincidences, his wish was funded by the donation Kitchen’s students made to Make-A-Wish Eastern North Carolina. For students, the opportunity to meet Scott and hear about his journey brought the project full circle. They listened intently as he recounted favorite memories from the trip and demonstrated light saber skills he learned from the Star Wars Jedi Training Experience at Universal Studios. Helms and his teammate Jones raised the most money out of both class sections and beat the record for most profit made in any of Kitchen’s classes, earning a little over $2,200 in revenue and $1,904 in profit. And for Kitchen – who was both surprised and impressed by the extraordinary performances and results achieved by his students – it was mission accomplished. “What these students accomplished speaks to the quality of entrepreneurs that we have on campus,” he said.